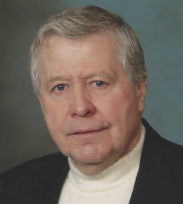 John A. Burridge - Perry-Komdat Funeral Chapel, Inc.
Poestenkill- John A. Burridge, 81, of Flint Drive, died suddenly on Sunday, June 1, 2014 at his daughter's residence after being stricken. Born in Manhattan, John was the son of the late Hubert and Martha Fogwill Burridge, and husband of the late Joan "Joni," who predeceased him in July 2004. In 1944, his family moved to the area and he was a graduate of the Averill Park High School, class of 1950, and attended Hudson Valley Community College. He served in the U.S Navy from 1950 to 1954 and was discharged with the rank of petty officer second class. While stationed in the Panama Canal zone, John met and married the former Ligia Sanchez Vega, and they returned to the States and settled in Poestenkill. John worked as promotion manager for Montgomery Ward & Co., and held various positions in the field of printed business forms. He had also worked for Oakwood Cemetery in Troy, where he was the superintendent. In 1984, John became a sales associate for Standard Furniture and moved to Kingston, where he was recognized in his first year for his outstanding sales record and was awarded salesman of the year. He went on to Promotional Products and started his own sales company Ad Specialties Plus in Kingston, which he operated until his death. While residing in Poestenkill, John was a former president of the Poestenkill Republican Club and was elected and served as a councilman on the Town Board. John also was active in Kingston politics and was chairman for the city of Kingston Conservative Party. John was a life member of the Sullivan-Jones VFW Post in Poestenkill and was a member and former commander of the Walter Adams American Legion Post in Averill Park. John had returned to Poestenkill in December 2013. John was the brother of the late Hubert, William R., and Charles C. Burridge. Survivors include his daughters, Patricia (Keith) Burridge-Ackner and Barbara (Mark Berner) Burridge, both of Poestenkill, and Linda (Jimmy) Singleton of Little Elm, Texas; his half brother, Gordon Smith of Newfoundland, Canada; four grandchildren, Matthew and Alexandra Berner, and Dylan and Shane Singleton; and a great-grandson, Mason Berner. Relatives and friends are invited and may call at the Perry-Komdat Funeral Chapel, 2691 NY 43 at Glass Lake, Averill Park on Thursday, June 5, 2014, from 4 to 7 p.m., followed by a service at 7 p.m. Visit perrykomdat.com for directions and private guestbook.